Hello, friends! I’m back with another card! This one is pretty simple- just like yesterday’s! 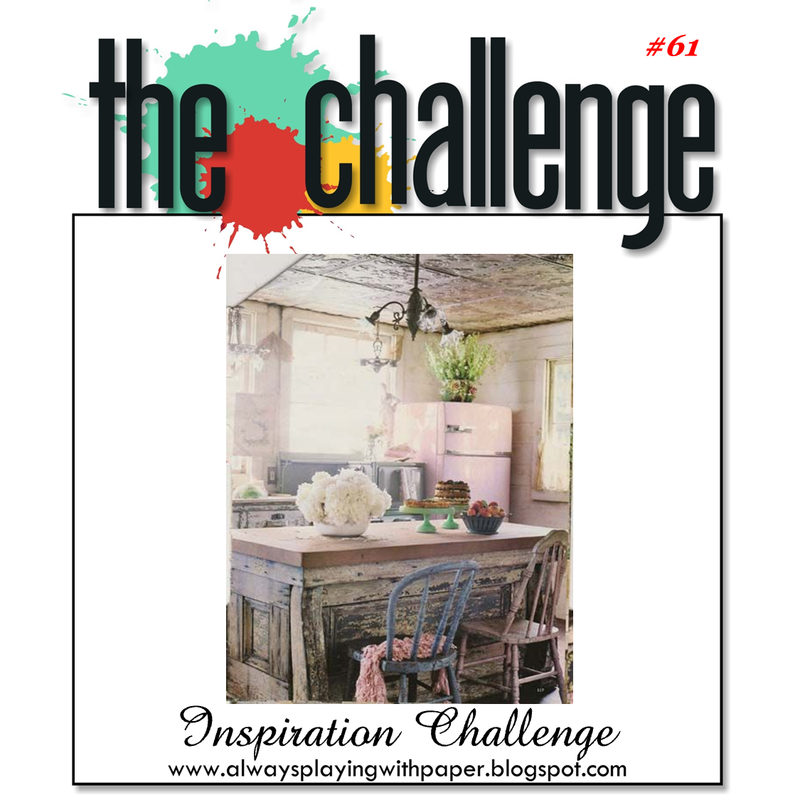 It’s also for a challenge from Sugar Pea Designs. Here’s a look at the card and how I made it! I wanted to try masking for this card! I haven’t done much of it before so I started with something simple. But, first, I stamped that (Gaelic?) border stamp across the card front. Then I drew some pencil lines using a ruler to measure them out. I took two piece of paper to mask of the rest of the card and used a funky polka dot stamp all around the frame. I then added a chef sticker from Michael’s and an “H” and “I” for the sentiment right under the chef. Hey, crafty people! I have 2 cards for you today! The first is a super clean and simple design that took literally less that 3 minutes to create. The second is a more colorful card with a simple sentiment. Here’s how I made each one of them! For this CAS card I simply used an A2 sized card base, my ombré ink pad from Tsukineko to ink up a floral image from a layering set, and stamped them along the right edge. Lastly, I took one of the sentiments from the set and stamped it in Versafine onyx black ink to finish the card! Hi, all!! Today I made a card for 2 challenges- My Favorite Things Wednesday Sketch and Color Throwdown Challenge CTD381! This card took me quite a while! I either thought way too much about or watching “The Shining” on Netflix got me off-track… Anyways, here the card and how I made it!! I started with a white A2 sized card base and rounded the top right corners. Then I trimmed down a piece of patterned paper, which was the closest thing to craft I had. I rounded all four corners of that piece as well as a piece of white paper that was about an inch smaller. Next, I layered on a small watercolor piece which I stamped with the hamster image from Lawn Fawn and painted a pink sky and green grass. Then I heat embossed “hello” with gold embossing powder onto a small strip of green card stock. I trimmed the end into to an arrow-ish end adhered a small pink strip below the green one. Finally, I glued on 3 small wood vaniers to finish it off! Hey, everyone! Today’s card is all about warmth! That’s the them this week over at Cute Card Thursday’s card challenge. I chose a “love” themed card with shades of pink and red. I started out with an A2 sized (shocker) card base. I stamped the “strings” in black Versafine ink and the different hearts in pinks. I then put down a blob of water color using my ink pads. Next, I used the black ink again to stamp the sentiment. It was a little unbalanced so I trimmed off the bottom to give it a more finished look! What do you think?! Hi, friendly crafters! This week over at The Challenge we are inspired by this photo! So here is how I made the card for this challenge! I started with an A2 sized card base and then layered a slightly smaller piece of pale blue textured card stock to act as a border for the beautiful floral piece of paper from Stampin’ Up. I then stamped a flower image in a light blue ink and grabbed my water soluble markers from Harvey LePlume to do some water coloring over the stamped image. I fussy cut the flower and stem and popped them up on my card. For the sentiment, I simply wrote “hello” onto a wood vaniet banner. Hope you play along and keep on crafting!! Hey, crafty people! Today I participated in the Monday challenge from Simon Says Stamp! This week’s theme is all about musical inspiration! I’m a big Cee Lo fan so I made this card based on a song by Common and him! I started with a small scrap of watercolor paper and used my Harvey LePlume brush markers to scribble on an acrylic block to use for water coloring! I only used 2 shades of pink. I trimmed it down and matted it with a black piece of paper (paint chip). Before I attached it to the base, which is a 4 bar size in pink, I slapped down a strip of gold washi. To finish it off I adhered a small white star embellishment! Here is the link to the challenge! Have a great Monday! Time for card number 2 of the day! This one was for the Fusion Card Challenge and MFT’s Color Challenge. I used the simple but amazing sketch and combined it with some pink papers. I started with an A2 sized card base and layered on 2 pieces of pink paper (actually trimmed paint chips from Walmart) mirroring the sketch. I added a textured lace sticker from the dollar store. I then stamped that beautiful layered flower image with a set from Stampin’ Up and fussy cut it out. Finally, from a different SU set I stamped the sentiment with Versafine onyx black ink. That’s all there was to it! I hope you get a chance to play along with these challenges! !